The Colorado Parks and Wildlife Commission during its monthly meeting May 10 in Grand Junction will establish license numbers for most big game species for the 2012 hunting season and consider a petition to allow rock climbing at the Rifle Falls Fish Hatchery, the agency reported in a news release. During the meeting, slated for 8:30 a.m. in the Courtyard Marriott at 765 Horizon Drive in Grand Junction, commissioners will also be asked to set or modify property regulations at several state wildlife areas and formalize an annual tradition of granting military veterans free admission to state parks on Veterans Day, according to the release. 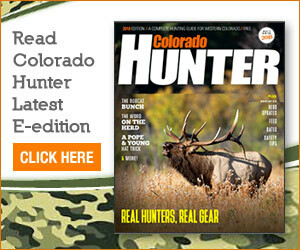 Colorado remains a destination for big-game hunters across the world and May is the month when the commission sets limited license numbers for deer, elk, black bear, moose and pronghorn for the upcoming hunting seasons. CPW biologists estimate the state’s post-hunt elk population at slightly more than 265,000, which is the largest herd anywhere in North America. Biologists also estimate Colorado’s deer population at 418,000 and pronghorn population at 71,000, according to the release. Wildlife managers will recommend a quota of 139,000 limited elk licenses for 2012, which represents a drop of about 2 percent from 2011. Biologists adjust license numbers to maintain population levels, according to the release. Wildlife managers will propose a quota of 80,000 deer licenses and 24,000 pronghorn licenses, which also represent slight declines. Meanwhile licenses for the state’s growing moose population are recommended to rise by 12 percent, while bear licenses will jump by 25 percent, as managers look to stabilize growing bruin populations in many hunt units, the release states. Also on the agenda is consideration of a citizen petition to allow rock climbing at the Rifle Falls Fish Hatchery. In January commissioners first discussed a request by the Rifle Climbers Coalition and the Boulder-based Access Fund to open the lower portion of Box Canyon on the Rifle Falls State Fish Hatchery to recreational rock climbing. Commissioners deferred action on the petition to allow time for staff evaluation, according to the release. Commissioners are scheduled to vote on a proposal to implement provisions of a law passed in 2011 granting free admittance for military veterans to state parks on one day each year. The change formalizes an annual tradition of the former Parks Board, which voted each year to provide veterans free entry to state parks each November 11 to commemorate Veterans Day, the release states. The Colorado Parks and Wildlife Commission is a 14-member board, appointed by the governor, which sets regulations and policies for Colorado’s state parks wildlife programs. To view the complete agenda for the May Parks and Wildlife Commission meeting, please see the commission web page: http://wildlife.state.co.us/ParksWildlifeCommission/Archives/2012/Pages/May10-11_2012.aspx. To access a live audio feed of the meeting, click on the “listen to live audio” link at the bottom of the commission webpage at: http://wildlife.state.co.us/ParksWildlifeCommission/Pages/Commission.aspx.